Back in 2005, a video of He-Man singing the hit 1992 single "What's Up" by 4 Non-Blondes became a famous meme and has gone on to receive multiple remixes and even parodies. But, it wasn't until 2010 when the most famous version of the video started making the rounds, which was just an edited, 2-minute version that took out the intro and outro of the original video. The He-Man video has since gone on to become almost as famous as the popular "Rickroll," with over 130 million views. Now, the meme has been immortalized in Masters of the Universe action figure-form, just in time for San Diego Comic-Con. Super7 recently announced their line of San Diego Comic-Con exclusives and the laughing Prince Adam Masters of the Universe meme action figure was a major highlight. Not only do you get an awesome version of Prince Adam laughing, but he also comes with a pink sword and the rainbow background. The details are spot on and the figure looks just like an old school Masters of the Universe toy, but instead of scowling, Adam is clearly enjoying himself. This laughing Masters of the Universe Prince Adam meme action figure will sell out and there's only one way to get your hands on one. Super7's San Diego Comic-Con exclusive Masters of the Universe figure will only be available at the Hordak's Lair Pop-Up Event, which is located on 701 Eighth Ave, in San Diego. The event will take place on July 18th, from 9PM to Midnight and then Thursday from 11AM to 9PM. It will be the only place to get the awesome laughing Prince Adam figure. Super7 is doing something different this year. Normally, it Skeletor's Lair, but Hordak from She-Ra is taking over. They will also be offering a She-Ra versus Hordak ReAction 2-Pack, a totally blacked out Skeletor figure with black packaging, a line of He-Man action figures in the style of G.I. Joe, and many other Masters of the Universe goodies. 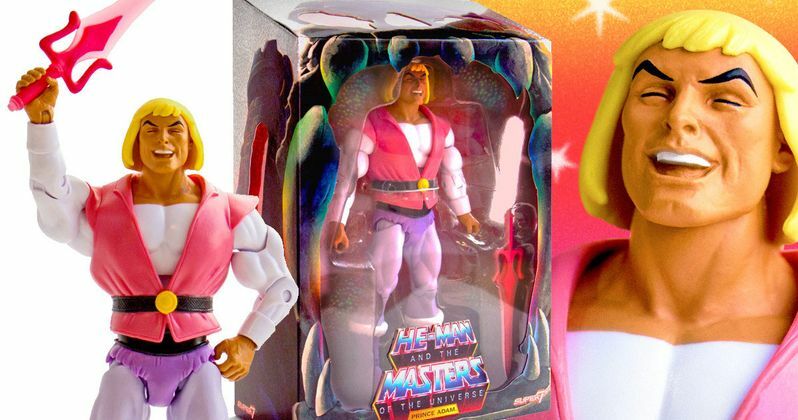 However, as previously mentioned, the Laughing Prince Adam meme action figure is by far the best of all of the Super7 offerings this year. While no price is available online, it's believed that the figure will sell for $25. In other Masters of the Universe news, Sony still has the December 19th for the live-action reboot. It was recently announced that the Nee Brothers have signed on to direct, but it seems unlikely that they will be able to keep that release date unless filming begins this fall. Additionally, Star Wars 9 comes out on the 20th, and a live-action Masters of the Universe movie will not be able to compete with that franchise, no matter who they get to star in it. News about the movie should drop soon, but you have about three weeks to plan your San Diego Comic-Con attack to get your hands on the Laughing Prince Adam figure. You get information about Hordak's Lair at SDSCC Blog and check out images of the figure below.